Digital Surrogates from the Great Lakes Quality Improvement Center for Disabilities Records, contain pictures, presentation slides, and conceptual guidelines concerning Head Start programs for Americans with disabilities; inclusion and educational programs for children with disabilities; as well as training of health and education professionals. Digital materials also include interagency agreements and information resources about legislation, institutions, care and learning about promoting inclusion of children with disabilities in several states. 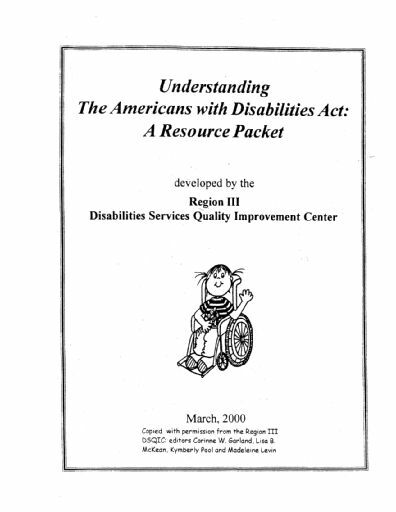 These files are a copy of a CD from the Quality Improvement Center for Disabilities. The Great Lakes Quality Improvement Center for Disabilities Records (Digital Surrogates), 1998-2003 are managed by the University of Illinois Archives and do not feature precise descriptive information for each item. Discover their contents by browsing the folders and files. For more information, contact an archivist at illiarch@illinois.edu.